For a complete products range , check their website HERE. Flower Color Blush is a lovely formulation infused with flower color wax, the wax that is deep within a flower's petal. We take that wax and mix it in with our powdered blushes. It gives wonderful slip the the product. 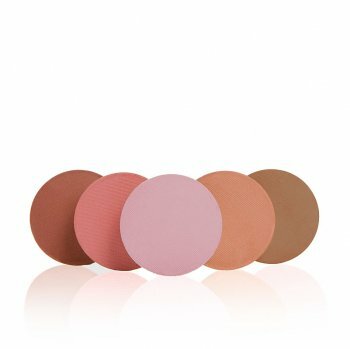 Silky smooth powder, naturally-colored in the full range for warm to cool skin tones. A pure and simple formula of sweet almond oil, natural pigments, flower wax and vitamin E. Talc-free, fragrance-free and no additives to cause sensitivity. Dual purpose, safe enough to use around the eyes. Gluten-free. 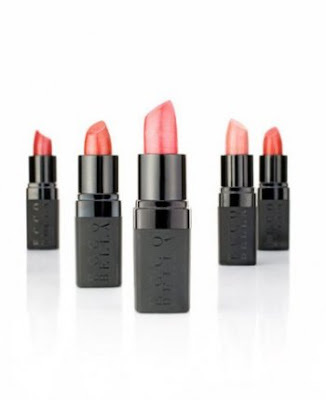 These colors are vegan: Coral Rose, Earthy Rose, Peach Rose, Wild Rose and Nutmeg. Ingredients: Mica, kaolin, cornstarch, magnesium carbonate, zinc oxide, sweet almond oil, lecithin, green tea extract, aloe vera extract and flower wax iron oxides. May contain carmine. It came in such a tiny cute little box. Which makes it very easy to carry anywhere and everywhere. A perfect peachy pink blush I was long looking for that looks natural on my skin and gives that rosey glow. Great pigmentation and great color makes this a worth buying product. I so love this color that I am using it on almost regular basis . Glides smoothly on your skin giving you that rosey natural glow. If you want a mineral blush . If you don’t want harmful chemicals on your face. If its price is not a problem for you. Only If you think its expensive. Definitely YES . I LOVE THIS BLUSH. 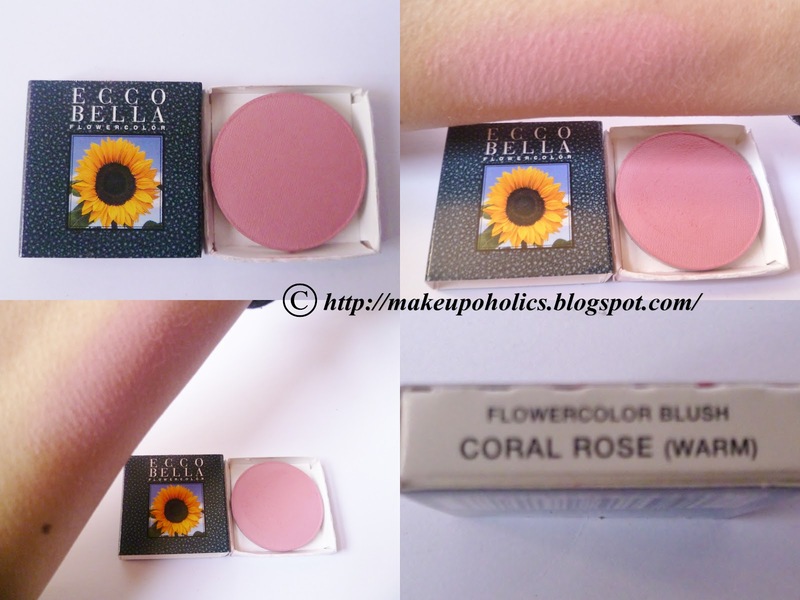 Ecco Bella Flower Color Blush comes in 7 Cool beautiful shades. You can buy Size: 0.16 oz. of ECCO BELLA Flower Color Blush in Coral Rose (Warm) having the Price tag of : $15.95 from their website HERE. Flower Color lipstick is a lovely formulation infused with flower color wax, the wax that is deep within a flower's petal. We take that wax and mix it in with our lipsticks and even our powdered blushes. It gives wonderful slip the the product. Ingredients: Castor oil, isopropyl palmitate (from palm oil), candelilla wax, 100iu Vitamin E, organic calendula oil, organic chamomile oil, organic jojoba oil, flower wax coated iron oxides. Pink colors contain carmine. A deep medium-toned warm brown with a hint of peach, with a slight shimmer. Fab on redheads and warm brunettes. Vegan. I must say that I was totally impressed by the packaging. Such a classy black packaging embossed with the company name Ecco Bella and wrapped in a black fine quality wrapper printed with the ingredients detail. But the color wasn’t the one I asked for. I asked for Flower Color Lipstick in Pink Rose (#10) which is a very light pink shade but I got Peach Rose (#12) which is more of a brownish tone , a color that I rarely wear. But even then , I gave it a try and I must say its avery vibrant medium toned brown shade with a hint of peach in it with very slight shimmers. Feels less darker on lips then on hnads. Once again , It changed my idea of trying lipsticks on hands rather then on lips while testing the colors ( you may have experienced this color difference sometimes). The texture is very creamy and moisturizing You don’t need to build it up to get the perfect shade. Lasting power is also great. It . it did lasts for more then five hours on my lips without any touch ups , pretty good isn't it. Based on all these qualities i think its gonna be a great lipstick for those peolple who love dark or warm shades. You can apply a clear gloss if you want to toned down its darkness .Otherwise , i love it the way it is. The best part is that its a mineral lipstick means it wouldn't harm or darken my lips in any way . I mean the thought that i am not having any harmful chemicals on my lips is very delightful. If you want a mineral lipstick. You don't want harmful chemicals on your lips. Only If you think its very expensive. Ecco Bella Flower Color Lipstick comes in 4 warm , 7 Cool and 5 Neutral beautiful shades. You can buy Size: 0.13 oz. 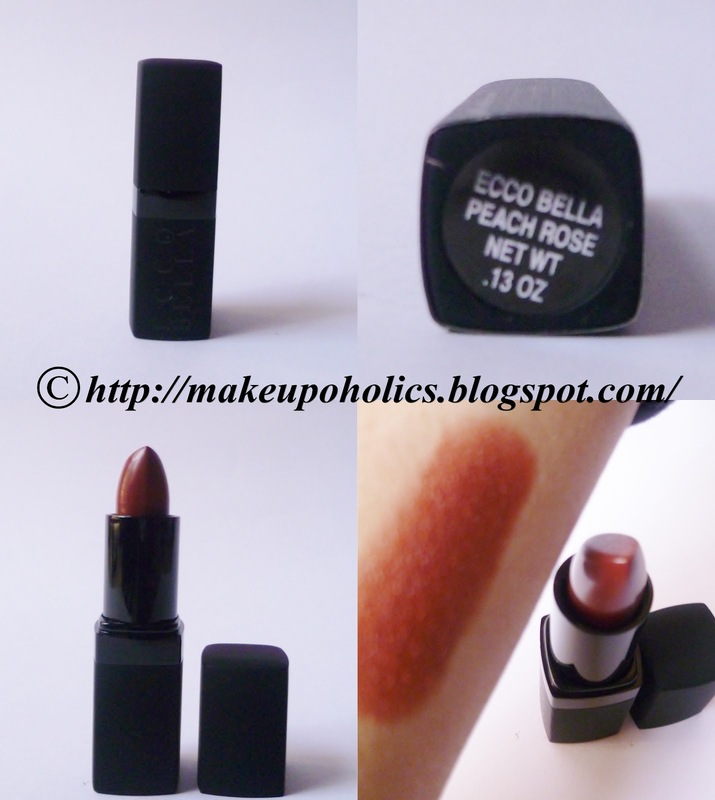 of ECCO BELLA Flower Color Lipstick in Peach Rose (#12) having the Price tag of : $17.95 from their website HERE. 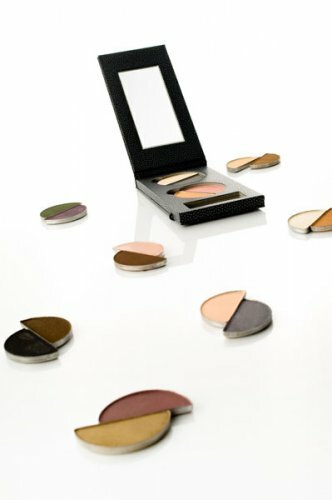 Ecco Bella eye shadow and blushes all come in refil packaging. Theyl duo compacts that the consumer can purchase . You can Check HERE. A great news for all my lovely readers. 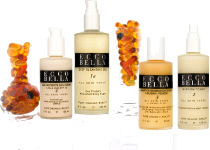 For more information you can check Ecco Bella Website .You can also join their Facebook page or follow them on Twitter. 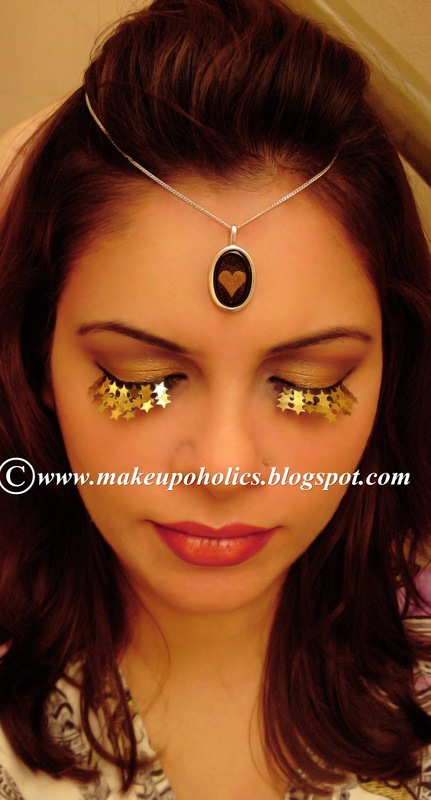 I have come up with the following THREE looks using Ecco Bella products. Fair and lovely as moisturizer. Aqua eye liner cake by Kryolan. Maybelline Falsies volume express ( review soon ). Maybelline Lip gloss ( review soon ). The products look great!! 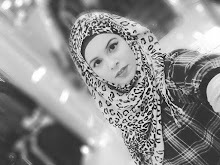 Nice looks!! !